Direction : Study the following pie chart carefully and answer the questions given beside. for SBI Clerk Pre 2018 from different states. What is the central angle made by students of Goa and M.P? In Tamilnadu if 5/18 enrolled students failed then calculate the number of students who passed in Tamil Nadu? We know that 10% of the students enrolled from Bihar did not appeared for the exam. So, the number of students appeared for exam from Bihar = 90% of the number of students enrolled Bihar. What is the difference between the Total number of students enrolled from Delhi and M.P. and the number of students enrolled from UP? 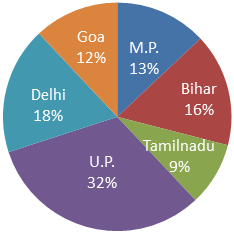 What is the sum of the percentage of students who enrolled from U.P., M.P. and Goa?